If Patagonia makes it, it's probably good and more likely great. Patagonia consistently produces the softest, warmest, most user-friendly synthetic fleece on the planet. Their long-sleeve Capilene Zip Neck is a favorite of mine. I've got just about the whole collection: weights 1, 2, and 4. Over time, I've learned that they each have their place. A big feature for me is that neck zipper, which gives you considerable extra control compared to a simple crew neck when it comes to staying warm or cool. Patagonia includes a host of unexpectedly brilliant features in all their clothing, and this top is no exception. Seams are rolled off the shoulders to avoid interacting with pack straps. The fit is contoured for more effective layering, and the fabric features a cool open weave that breathes well. Choose the Capilene 1 or 2-weights for speed ascents in mild to cold weather. Pick the Capilene 4 weight for Alpine (ie, downhill) skiing and/or bitter cold weather. All of the Capilene tops work well in layered systems or as a stand-alone garment. All offer outstanding insulation value for their given weights. Previous versions of Capilene were known to suffer from odor management issues. That appears to be a thing of the past, now. Patagonia's non-toxic 'Gladiodor' system keeps unwanted smells away. 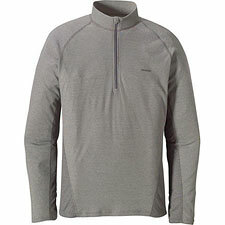 As mentioned, I find the zip-neck feature absolutely essential in the backcountry. Zip up the neck, and the top's warmth skyrockets. Unzip the neck when you're climbing hard and starting to sweat. This seemingly-simple feature lets you avoid taking off and putting on clothes repeatedly. Instead, you stay comfortable—and on the move. The texture of Capilene fleece really has to be felt to be fully appreciated. It's every bit as good as you've heard: soft and natural against the skin. Today's Capilene uses about 50% recycled materials, for a reduced environment footprint. The wool-vs-synthetic debate remains open when it comes to baselayer insulation, but for now this is about as good as synthetic gets. Highly recommended.